Want to do an MSc or PhD in this field? See here. 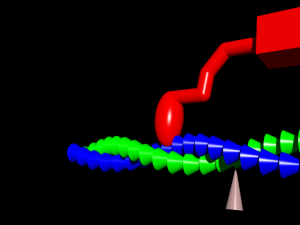 Research group studying the physics of polymers and biological systems headed by Kristian Müller-Nedebock. Polymer and filament networks, active systems and physics of structures at cellular and sub-cellular length-scales. Work is mainly theoretical. Collaborations at Stellenbosch University and internationally. For more click “Research” and “Persons” above. Recent papers under “Outputs & Posts” above. The group functions within the theoretical physics environment of the Department of Physics of Stellenbosch University, located in Stellenbosch, South Africa. We have close connections and research collaborations with other groups at Stellenbosch including the Laser Research Institute, the Department of Chemistry and the Department of Physiological Sciences. Funding: Our research activities are generously supported through grants, participation and scholarships from various organisations, including the National Research Foundation, the Organisation for Women in Science for the Developing World, the National Institute for Theoretical Physics and under the Newton programme. We are extremely grateful to these organisations for their support. Copyright: Images and texts on this site may not be reproduced or used without permission.